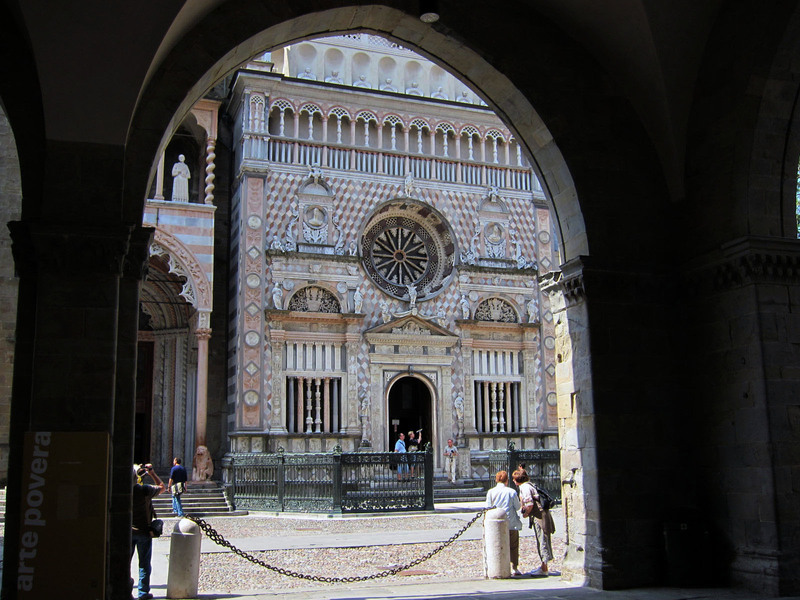 Our visit to Bergamo was more or less a last minute decision thanks to United Airline. We had a pre-paid non-refundable two night booking in Torino. It would have been a quick visit to get through any problems with jet-lag before we drove down to Tuscany for the wedding of our Italian nephew. The first time the United plane returned to the terminal in san Francisco was for a “Cargo Issue”. The flight attendant told us it was probably a bag loaded below didn’t have an owner up top. Since we were waiting on the runway for over 30 minutes, we also needed more gas. It kind of reminded me of the scene from the Marx brothers “Night at the Opera” when Fiorello (Chico) disguised as one of the world’s greatest Russian aviators says to the reporters at a press conference, “The first time we started we gotta half way there and we run out a gasoline and we gotta go back.” 45 minutes later we were back in the flight cue. They thought they could fix it in the air and after we circled San Francisco for about 30 minutes, he came back to tell us fixing the problem was beyond their ability. They were going to scrap the flight, but first they needed to dump all the fuel. The real problems with United Flight 900 didn’t really begin till after we landed. The flight purser was clueless, the ground staff was inefficient and most of the 280 or so people on the flight were forgotten or ignored. We were able to get on another flight 30 hrs later so we took a cab home. The only good thing about having a flight cancel in your home town is you can go home. When we got back to the airport the next day we heard a lot of talk about the ill-fated United flight 900. Some of the passengers were at the airport for over 7 hrs trying to get onto another flight. Many hours later we arrived to Milan Linate airport and collected our rental car, a Lancia Mussa, which we thought was Musso, Italian for snout. For the next 10 days we kindly referred to our car as “SNOUT”. We missed out hotel reservation in Turin. We learned our lesson. Either get trip insurance or never book a pre-paid reservation on the first leg of the trip. 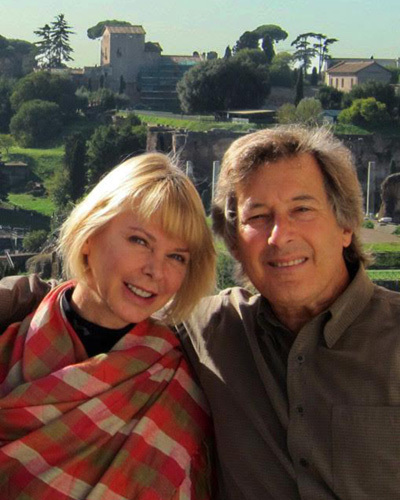 By the time we got to Italy, we had one night before we had to get to the wedding. Turin was a little too far. Bergamo was closer. 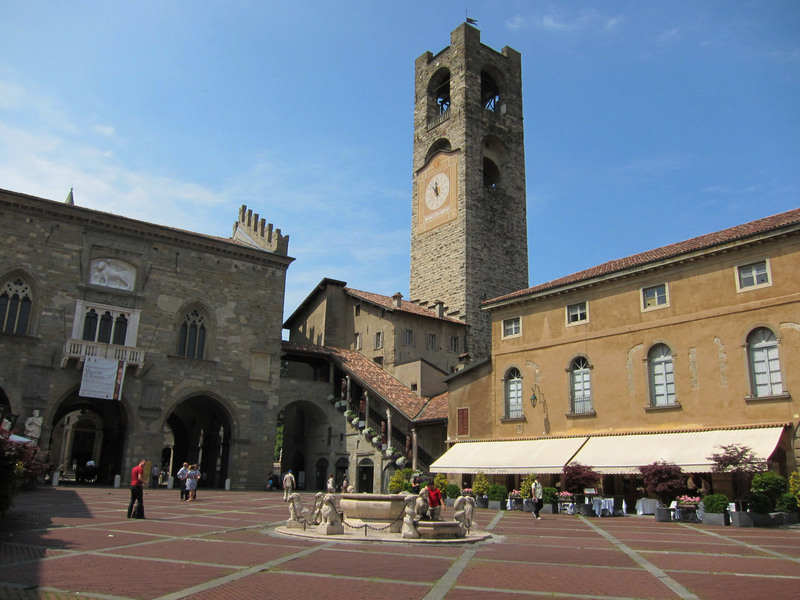 Time to shed the past problems and jump into the past history of Bergamo Alta. 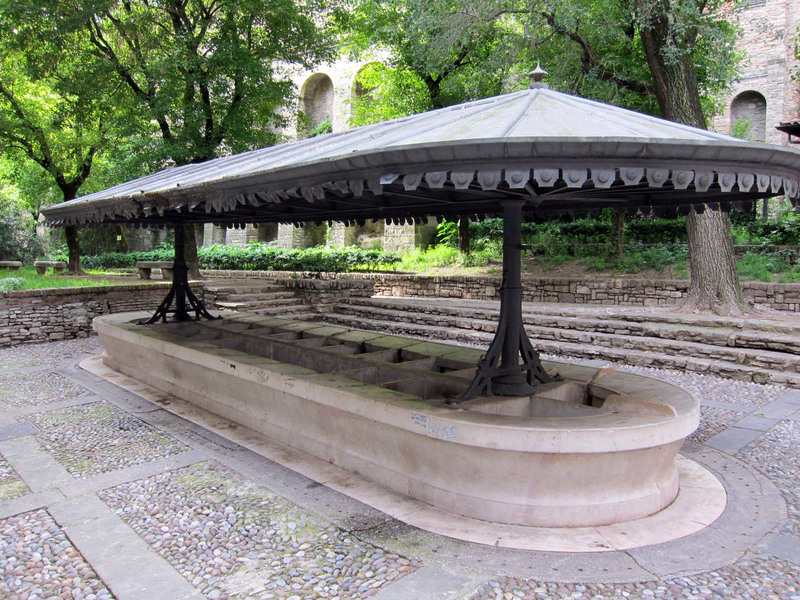 Bergamo Alta is the upper city surrounded by 6200 meters of 17th century Venetian walls. Inside of the walls are buildings going back to the 12th century. The streets also date back to the 12th century and driving around them in a 21st century car is an amazing adventure. Parking is almost non existant. The easiest way to see the old city is to park in the lower city, Bergamo Bassa, and take one of the funiculars up. When we made the reservation for our hotel in the upper city I asked about parking. The hotel manager siad they would give us a parking voucher which would let us park in any of the parking lots of Bergamo Alta. When she explained it over the phone, it sounded easy. Yes, they did give us a parking permit but that didn’t mean there were any available spaces. There are a lot of cars in the upper town and not very many places to put them. We finally found a spot near the Museum of Natural Sciences only to be woken up the following morning at 7am to inform us we needed to move “Snout” because there was an antique car race coming through and she was in the way. We brought a Garmin 2475 GPS this time, a big change for a map enthusiast like me. I had no idea how great it is to drive through Europe with GPS. All the European and American maps are preloaded at no extra charge. We call it PIG (Position Information Guide). At first we doubted some of the turns she was taking us into. They looked more like driveways than roads, but we eventually learned to trust her. Using a GPS takes a leap of faith on both ends. Bergamo Alta is a beautiful restored city. After getting settled into our hotel, we set out for a small dinner at 10pm, just in time to hear the nightly tolling of the bells in the 11th century Torre del Campanone. Every night at 10pm, the bells toll 100 times. They’ve been doing it for centuries, letting everyone in the city know that the gates are closing and this is basically last call to get back into the safety of the walled in fortress. The bells were almost melted down by the Germans during World War II, but luckily they were saved. Even though the walls don’t close up anymore, nor is there any danger of staying outside the walls after 10pm, it’s been a tradition for a long time. We are staying at the Gombit Hotel, a small beautifully designed hotel built next to the old Gombito lookout tower. The Gombit hotel was once an army barrack. Now it’s a very comfortable rest stop. To the side of the hotel is an old communal laundry with plumbing to each wash basin, kind of a very early laundromat. Even now, hundreds of years later it still works. We had a nice walk around the old city at night and a nice walk around the old city in the morning. This was once a city of great importance in the 12th century wars between the Guelphs (Pope supporters) and Ghibellines (Holy Roman Emperor supporters) and the eventual defeat of Holy roman Emperor Frederick I Barbarossa. Most of the old town dates back to this period. I know the 12th century might still be considered by some to be during the “Dark Ages” but I think the 12th century architecture is amazing. Personally I think the “Dark Ages” only lasted from the the 5th to the 10th century. For all you Comedia dell’arte fans. 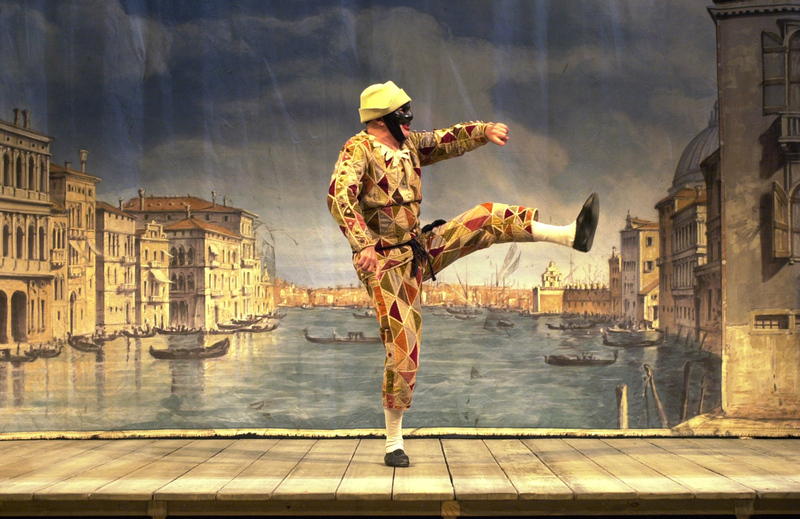 One of the main characters, Arlecchino (Harlequin) came from Bergamo. The city was always known for its silliness and buffoonery, to the point of creating its own folk dance called the Bergamask in the 12th century. Bergamaschi are clowns, and so it was really appropriate for us to dine at “La Dispensa di Arlecchino, a really good restaurant about 50 meters from our hotel. We needed to check out of the hotel by noon and had to be on the road at the same time. We’re off to Tuscany for the wedding of Francesco and Tiziana.